Irish angel is a glass figurine that features a shamrock along with LED lighting. This illuminated Irish angel includes the batteries. This Irish angel figurine features a shamrock along with an LED light that continually changes color. 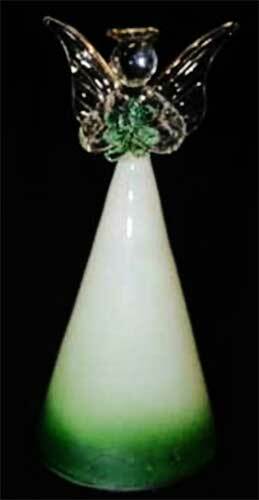 This glass Irish angel (base is plastic) is holding a green glass shamrock and has a dimensional design that measures 6” tall x 2 3/4" wide. The Irish angel is gift boxed with a shamrock history card, complements of The Irish Gift House. Irish Christmas ornaments are a set of four illuminated glass angels that are each holding a shamrock.